On Friday, September 4, CIHR staff and fellows will be speaking at the „Das ist Netzpolitik!“ conference in Berlin. Here is a short overview of their talks. 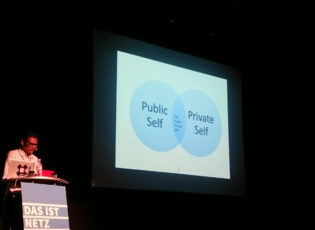 Nishant Shah defies the idea of the individual self and claiming that the self itself is a network. Shah will present his research about the Self as a Network at Viadrina on September 3, 2015. The talk is open to the public. CIHR participated in a background study to inform a report on encryption prepared by David Kaye, the UN Special Rapporteur on the freedom of expression. On Friday 8. May 2015 from 12:00 to 13:00 we will host a talk with Mustafa Naseem, the Director Innovations for Poverty Alleviation Lab (IPAL) at the Information Technology University (ITU) in Lahore, Pakistan. CIHR staff and fellows presented their ideas at the re-publica 2015 conference in Berlin. In recent years, there has been a growing concern about oppressive regimes using surveillance technologies in ways that led to human rights violations. The Centre for Internet and Human Rights will be participating in the Global Conference on Cyberspace in The Hague on April 16-17, 2015. Algorithms are increasingly used to make decisions for us, about us, or with us. From areas of life that did not exist more than a decade ago, like online search or social media news areas, to fields where decisions used to be made exclusively via human judgement. The exchanges initiated during the Ethics of Algorithms event in Berlin helped to deepen our understanding of the way algorithms govern our lives now and refine questions for future research. At the beginning of March, the CIHR will bring together leading experts from academia, technology and civil society to discuss the ethical dimensions of algorithms. The event will be hosted by the Technical University of Berlin.